Croydon Bowling Club recently hosted a “Bowling Arm Training Day” thanks to the proactive foresight of one of accredited Coaches, Robin Shaw. With the support of the Croydon Bowling Club, A.J. Parker and Doug Corrigan (also a former State Rep.) of the Ringwood Bowling Club the focus became that of a group coaching clinic. Clubs in the Eastern Ranges Region were invited to participate and members from Ferntree Gully, Bayswater, Boronia, Heathmont, Chirnside Park and Eastwood accepted as well as members from Croydon of course. Numbers were limited to 4 per rink to ensure maximum attention to the coaching needs of every participant and a total of 35 bowlers participated. Feedback was that the day was full of FUN, LAUGHTER, LEARNING and GREAT FELLOWSHIP on the greens and over a great BBQ Lunch. Each individual has their own disability ranging from back injury to arthritic hands. Bowlers Arms are a tremendous aid to keep bowlers in the game and the specialist coaching from AJ and Doug, ably assisted by several local club coaches ensured a successful day. Many thanks to all involved including Pam and Peter Arnot, Phil Parker, Rob Waghorn and the other members of the Croydon Bowls Club who supported this successful day. Based on the response, arm bowlers in the Eastern Ranges Bowls Region will see another clinic at Croydon Bowling Club in 2019. Please Click here to view their site for more photos….Well done Croydon! or Click here for the Bowls Vic. review. Hi to all Armed Bowlers looking for HELP! Help is available, but it’s your last Chance before the 2017-18 season ends. See Below. The Last Clinic for the ’17-’18 Season is at Preston Reservoir on 25 Feb. 2018. “A clinic will be held at Preston-Reservoir Bowls Club on Sunday, February 25. State coaches and State arm bowlers will be in attendance to help arm bowlers with their game. ‘We have just finished our 1st Coaching Clinic at Kings Meadow, where we had 29 Arm Bowlers who were overwhelmed by the fabulous presentation that Allan Starrett [NSW -pictured right above] gave them. He is a true professional, had them all engrossed with his wit, charm and charisma and in no time, had enticed them on the green, practicing all the points that he had spoken about earlier in the presentation. The afternoon session was as the morning, with an extra few coming who could not attend for the whole day, being catered for as well. The Coaches received a ‘1 on 1’ with Allan Starrett in the afternoon session, whilst Owen Preston [BWBAT] coached the others and critiqued the morning bowlers. It was a good showing with great results and positive feedback from the “Questionnaire’ that had been prepared for them to complete if they wished too before they departed. We have another Coaching Clinic in Burnie on Friday 20th October with 33 enrolees making it a bigger attendance than the Kings Meadow Clinic, looking forward to the day. “We have as of today 21 applicants for our Coaching Clinic that will be held this Wednesday 18th October at Kings Meadow Indoor Bowls Complex. This total comprises of Bowler’s Arm players, intending players and coaches. The coaches may be bowlers but, are not Bowler’s Arm players. They may want to know how to coach bowler’s arm players in the future, or when they may be called upon to do so. We also have at this time another 2 Coaching Clinics that will be held at Burnie Bowls Indoor Complex on Friday 20th October 2017 with 29 applicants so far and Howrah Community Bowls Centre on Monday 23rd October 2017 with 7 applicants to date. Note ALL CLINICS COMMENCE AT 10.AM. All Coaching Clinics are still open for bookings but will close by 7pm the evening before the scheduled Coaching Clinics commencement. Enrolees are asked to bring a lunch as there are no amenities on site. I will have some photos to add to this update from Wednesday, and will also have pics from Burnie and Howrah plus any other news. This project is so remarkable with the applications and also the many enquiries for information, that I am totally ‘blown away’ and so proud of the work that my committee and myself have put into this event becoming a reality. I also thank the Armed Bowlers of Tasmania for supporting me and the coaches. A special ‘Thank You’ to Allan Starrett for giving his time and expertise so freely, to get us started in Tasmania. Coaching Clinics for Coaches & Intending Bowler’s Arm Players in Tasmania. *The clinics are at no cost to participants but there will be a charge per person to cover the hire of the complex for the day. All Coaching Clinics will commence at 10.am. Afternoon: Approx. 2 hours. Coaches will coach players with support assistance from Allan Starrett and Owen Preston. B.Y.O lunch as no catering will be available; Meal purchasing facilities are close by all centres. There will be Tea/Coffee facilities available on Arrival. Owen Preston. Bowler’s Arm Coach. Tuesday 7 March 2017 San Remo Bowls Club – 10.00am registration for 10.30am start, $10 charge. Wednesday 22 February 2017 Warrnambool City Memorial BC – 10.00am registration for 10.30am start, $10 charge. Tuesday 21 February 2017 at Horsham City BC – 12.00noon registration for 12.30pm start, $10 charge. Thank you, Ted, for your words and photos below. “The day was sunny and pleasant, just right for Lawn Bowling. There were several Armed Bowls Coaches in attendance and it was good to see the eagerness of each of the participants as they applied themselves to the task of gaining as much knowledge as possible to improve their skills. After the lunch break questions were asked and answered. Teams were selected and a short game of eight ends was played, after which the Coaches awarded four players with a present for those whose attention to the Coaches instructions seemed taken on board and displayed a marked improvement. Two Men and two ladies won the hats and cloths. The Bowlers Arm group do a magnificent job in their Coaching Sessions. Sun. 17th Jan. ’16, Yallourn BC – West Gippsland Div., 10.30am ($10 inc.lunch) Click here for the flyer. From the Bowls Vic. 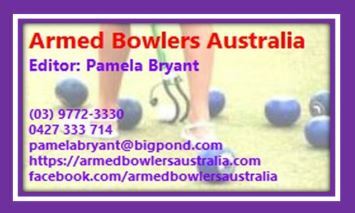 Site “More than 30 arm players attended the Bowls Victoria coaching clinic held recently at Yallourn BC. Players from San Remo, Traralgon RSL, Morwell Club, Yallourn North, Warragul, Morwell BC and Yallourn took part, receiving coaching from coaching committee member A J Parker, and Mike Scotter. “The day was a huge success and the feedback from participants has been very positive,” Yallourn club President Spencer Goss said, and thanked club organizer for the day, Fran Clark. Victorian State Arm Bowling Co-coordinator Phil Gude said the final Arm Coaching day for this season will be held at Heathmont BC on Sunday, February 28 from 10.30am. Players from the Eastern Ranges Region are especially invited to attend and be coached by State Arm players and coaches. Sun. 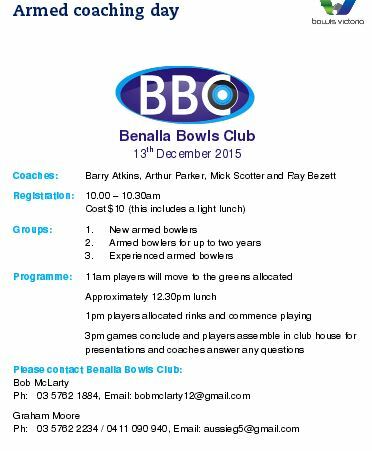 13th Dec. ’15, Benalla BC – Ovens & Murray Reg., 10.30am ($10 inc.lunch). This Day was tremendous in terms of attendance and the weather was “Crackerjack”. Well done Benalla!